El Rey de Mundo cigars have been around since the late 19th century. Created by German Emilio Ohmstedt in 1848, these delicious cigars are have now split into two different cigar brands. 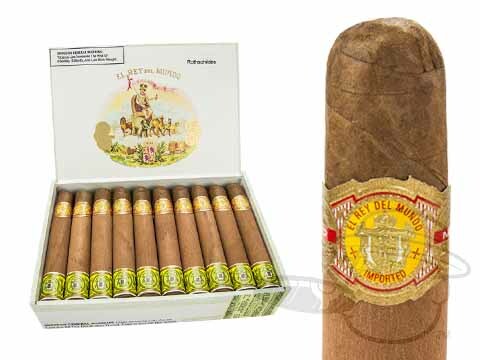 One is produced in Cuba for Habanos SA, and the other El Rey de Mundo is produced in Honduras by Villazon & Co. The original El Rey de Mundo cigar rose through popularity in the early 1900s as it was purchased by Candido Vega Diaz. 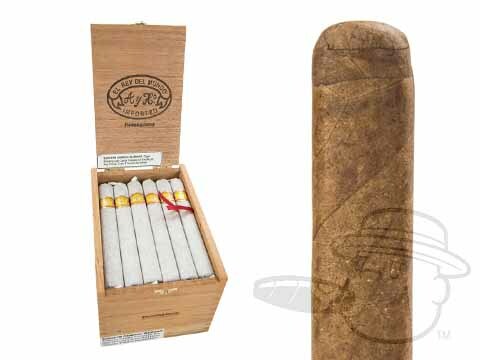 They also produced Sancho Panza cigars, as well as Don Candido cigars, which were the pre-cursor to Dunhill cigars. El Rey de Mundo cigars maintained their popularity through the Cuban Revolution, but a change was in order for these cigars. The palates of smokers had changed, and people were interested in something milder. The era of "light" had swept the country, with the popularity of such brands as Miller Lite and Marlboro Light. The decision was made to create a Honduran cigar that was milder, that would cater to more smokers in America that could no longer purchase their Cuban masterpiece. The quality of El Rey de Mundo cigars have remained true to their origin to this day. This classic cigar is a staple in many smokers humidors. One of the best selling Honduran brands in our humidor, El Rey de Mundo cigars deliver quality every single time. A perfect evening cigar for the regular smoker, as well as a good cigar for the novice looking to try a legendary cigar. 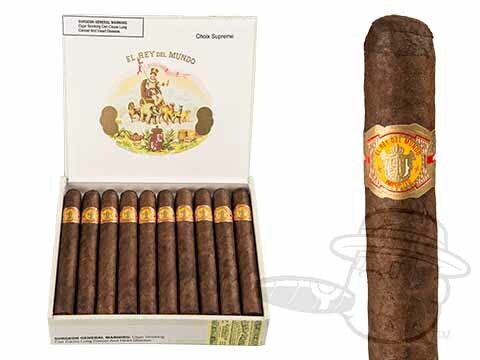 Upon lighting up a El Rey de Mundo cigar, you'll instantly be drawn in by the rich flavors. The mellow Honduran tobacco produces a nice leathery aroma as well as creating a good amount of smoke. El Rey de Mundo cigars use premium Honduran tobacco for the binder and filler, but there are two different wrappers: an Ecuadorian grown Natural, as well as a Connecticut Oscuro wrapper. The Oscuro is a wonderful medium bodied smoke that packs a bit of a punch for an El Rey de Mundo that's typically considered a mild cigar. 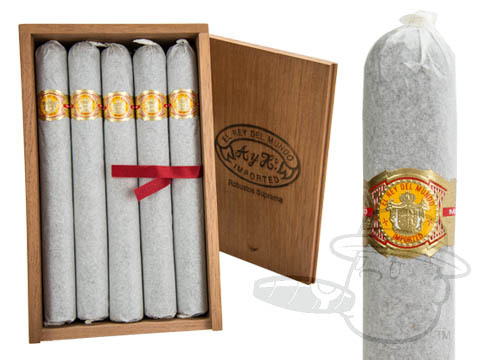 El Rey de Mundo cigars come in a variety of sizes, in the classic Cuban-style box. Each cigar is carefully wrapped in tissue or cellophane to insure the quality of each vitola. 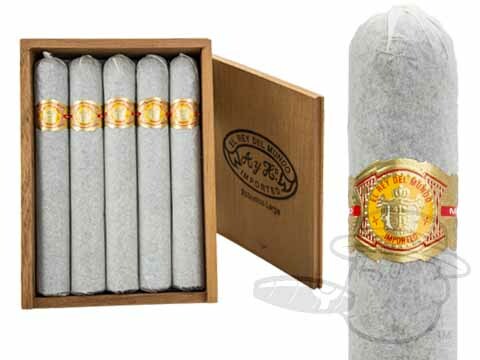 Varying in price depending upon the size, most El Rey de Mundo cigars are priced at under four dollars a stick. Whether it's the incredibly popular Cafe Au Lait, which is 4 ½ x 35, or the 7 x 49 Double Corona, there is something for everyone in this ageless brand of cigars. This is a quality cigar offered at an affordable price, considering it's made at the same legendary factory that produces Punch and Hoyo de Monterrey. The people over at Villazon certainly know their Honduran tobacco, and it's rare that you'll find any imperfection in their cigars. 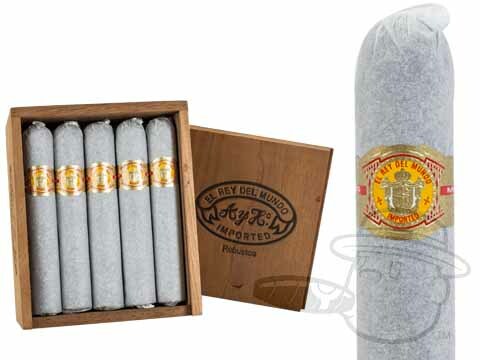 Whether it's a box, or just a five pack, you can't go wrong with El Rey de Mundo cigars. Each one of these cigars represents a history that spans back to the 19th century. It's no wonder why this cigar has been around so long. Quality through and through, give us a call at 1-888-412-4427, or order a box online today!